Between my banlist testing series and Thanksgiving, it’s been a heavy few weeks. For something lighter, this week I’m investigating the in-game mechanic known as velocity. Velocity is old news to Modern, but recently, a number of high-velocity aggro decks have gained prominence. Why is no mystery, as there is tons of red looting in Modern and recent sets have brought some excellent payoffs. The real question is how to respond. Velocity, literally, means speed. Physics says it’s speed in a given direction; in economics, velocity refers to rate of money circulation. In Magic, velocity describes the motion of cards between zones. Historically, velocity has meant moving cards from library to hand, and then to the graveyard via cantrips. However, it could apply to any movement of cards, such as dredging (library to graveyard, dredger to hand). The more often and more efficiently the cards move, the higher the velocity of the deck. Frequently, a deck’s velocity is folded into its tempo: one facilitates the other. Tempo-oriented decks often maintain high velocity to ensure that tempo by letting cards draw on velocity-provided resources, such as a packed graveyard. Velocity is so important in Modern because card advantage has historically been quite poor. This left velocity card filtering as the only option. Until recently, there weren’t many ways for decks to cheaply accrue card advantage. Ancestral Visions and Jace, the Mind Sculptor being unbanned have largely changed this. Modern’s most explicit velocity cards are looting, or draw/discard effects, primarily in red. Faithless Looting and Cathartic Reunion serve as poster children, moving cards in quantity from library to hand and graveyard. Wizards has been less afraid of this effect than of blue library manipulation because it’s not card advantage. However, recent payoff cards like Arclight Phoenix enables new decks built to make Looting actually read “Draw four cards”. While unbanning Golgari Grave-Troll certainly helped dredge in 2016, in many ways it was Cathartic Reunion that took the archetype to Tier 1. Discarding two Grave-Trolls, then dredging both to find a third, was stupidly powerful. Rebanning Grave-Troll did away with Dredge until recently, but the deck is still functionally identical to those earlier versions. If anything, embracing Life from the Loam and Conflagrate has made Dredge care about velocity more than before. Like looting, Dredge is an explicitly high-velocity mechanic since it moves a chunk of library into the graveyard. Adding excellent enablers in Looting and Reunion supercharged it, and I’d argue these are the real backbone of the mechanic in Modern. What Creeping Chill has done is added to the velocity, moving a card from graveyard to exile with an effect; that subtle speed increase acts as a blast of nitrous-oxide in an engine. Coupled with Life fueling Conflagrate, it’s created a deck that needs to constantly move cards between zones, while earlier versions were cool just dredging once an turn. I have had a very different experience against new Dredge than other players. Playing UW Spirits against Dredge has been something of a cakewalk for me, but apparently I’m in the minority. The fact that I’m running Remorseful Cleric maindeck is certainly a factor, but I’m doing well in matches where I never see Cleric. I’ve come to theorize that this difference is because I attack the enablers, and not the payoffs. 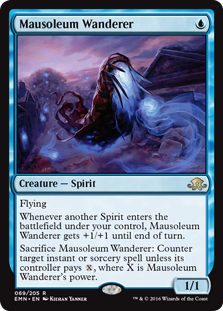 I’ve found that countering Looting or Cathartic with Mausoleum Wanderer is devastating for Dredge against UW Spirits. Getting Shriekhorn is okay, but unless Dredge can get dredgers back into the ‘yard and use them, it’s too slow. If the first loot doesn’t go off, Dredge has to spend the next turn on another loot, and won’t actually have something threatening happen until the turn after. This experience shapes how I approach the new hotness of Arclight Phoenix. Despite having the wrong shell, Jordan was right about Arclight Phoenix. The key problem his brews had was not courting Phoenix seriously enough. There have been a lot of different shells proposed for Phoenix, and it’s not clear which, if any, is best. The most high-profile success so far was an Izzet splashing black at SCG Las Vegas. This version really leans into velocity payoff cards. Thing in the Ice wants the exact same thing as Phoenix (though triggering both the same turn can be risky) and also clears the skies for the fragile bird. All the effort to make Thing and Phoenix work also benefits Crackling Drake to the point that a single swing can be lethal. It is a case study in synergy built around card velocity: the deck just needs its cantrips to resolve. It’s far too land- and threat-light to play grindy, Jund-esque Magic. This deck and its cousins have risen as decks of the moment, derived from the excitement over Phoenix’s newness. Whether they have staying power is impossible to know, but players have been trying to make Thing work for some time. Phoenix may be what makes this type of deck stick and bring this archetype to mainstream Modern, as it’s mostly just been prevalent in Legacy before. This type of loot-focused strategy has been around since spring in the form of Hollow One decks. Despite starting off strong, it has fallen off as players have become frustrated by the deck’s randomness and the metagame has shifted to combat large creatures. While the deck is built to minimize and take advantage of the random discard, it could never be eliminated, and apparently it suffers from anemic loots and inconsistent starts. Leaning into the cantrips and changing up the threat suit has been proposed to fix the problem, which has led to Hollow One and Arclight Phoenix fusing in a strange partnership. This deck is as new as it gets, and it’s therefore impossible to say if it’s actually good, but it makes sense to me. Embracing the all-or-nothing, loot-or-die strategy of this deck is the logical endpoint for maximizing Phoenix, and Hollow One and Flameblade Adept compliment the engine without cannibalizing the graveyard resource. The deck is capable of blistering starts, as a result and can hang in the midgame thanks to how quickly Bedlam Reveler gets set up. Arclight itself also provides some mid-game oomph. The great advantage of these decks is their velocity. Churning through as many cards as possible helps Arclight decks see whatever they need to, all while making their otherwise weak threats explosively powerful. Hollow One is only Modern-playable when it’s free. The price is that if they aren’t looting like barbarians, the decks don’t work. Like certain types of shark, these decks must keep the cards moving or they just stop. I think this is the pressure point to attack. Faced with these velocity decks, players have been gravitating towards graveyard hate. I certainly did during PPTQ season. It makes sense, as these deck have varying levels of graveyard dependence. Against Dredge, Rest in Peace is practically game over. However, I’ve never found graveyard hate to be particularly effective against Hollow One or Arclight Phoenix decks. They certainly get a lot of value from their graveyards, but their best and most dangerous starts outpace hate that isn’t Leyline of the Void. More importantly, as long as the cards keep flowing, the decks keep producing threats to eventually overwhelm opponents. I’ve recently found more success in sideboarding as I would against Storm. Shutting off the graveyard is at best mediocre when Arclight decks are chewing through their library; Ross Merriam’s deck even shrugs off Rest in Peace with Crackling Drake. The key to really clip the velocity decks’s wings is literally slowing down their velocity by reducing their ability to cycle through cards. Any delay in getting the engine going can be devastating. My experience against Dredge with Spirits suggests that countering the first big card movement, either Faithless Looting or Cathartic Reunion, buys about two turns of breathing space. The first comes from Dredge not doing anything that turn; the second comes when they spend the next turn trying to resolve their setup cards instead of doing the broken thing they’re setting up. The same strategy is effective against the Phoenix decks. Thalia, Guardian of Thraben is surprisingly disruptive against all these strategies if she hits early. Just like against Storm, preventing these decks from playing multiple spells per turn is incredibly potent. Eidolon of Rhetoric can also work, although it’s very slow. Most of the time, opponents will have fired off enough spells to have fielded a decent clock by turn three. Far more effective is the cheaper Damping Sphere. Against Arclight decks in particular, Sphere ensures they can play at most two spells a turn, which is far too few. As mentioned, graveyard hate can be effective, but it depends on the exact deck. Mono-red Arclight is more vulnerable than Izzet versions because of Bedlam Reveler. I thought that Spirit of the Labyrinth would be good, but it hasn’t worked out. When I’ve Vialed it into play in response to a loot, it has worked wonders, but those opportunities are rare. Worse, it is as fragile as can be, and running it out unprotected is often necessary. Given that Gut Shot is a maindeck card for these decks, I’d stay away from Spirit. Perhaps it goes without saying in a format like Modern, but to ensure success, the above tools should be paired with a relatively proactive gameplan. Sitting around making land drops gives opponents time to find the mana necessary to play around something like Damping Sphere. Combo decks also don’t really need to worry about these decks as the matchup is a straight footrace. For control decks, the solution is more complicated. On the one hand, UWx has Terminus to clean up the recursive mess these decks leave. This buys them the time to catch back up and turn the corner. However, because Terminus tucks creatures into the library where they can be found again thanks to all the cantrips, it’s not an infinite amount of time. Control has been suffering lately because the usual plan of planeswalkers and Celestial Colonnade is too slow. The other problem for control is that taxing effects also the pilot. Thalia is only slightly less annoying for UWx than for Phoenix. Sphere is an option, but again, the decks are too slow to really wield it effectively. This might be overcome by retuning maindeck configurations. Recent lists prioritize board control and card drawing at the expense of counters. Playing more cheap counters and faster win conditions could effectively delay the velocity engine from getting going. The other option, and I harp on this a lot, is playing more hard answers. The current UW answer suite consists of softer or more expensive answers, with only Path and a few counters for hard removal. Playing more sweepers and fewer conditional answers like Oust or Timely Reinforcements could be crippling, especially against the threat light decks. If the trend of high-velocity aggro is sustained, I would expect Jeskai Control to gain popularity thanks to its greater answer density. More importantly, it has Anger of the Gods, which is lights-out against Affinity and can prove crippling against Phoenix and Dredge. The key to beating the new crop of high velocity decks lies in recognizing their inherent fragility. Their busted starts and scary turns are all built around burning through their cantrips. Once players recognize and target that engine, the Phoenix decks are sure to struggle. That old sideboarding adage applies: don’t just target the dangerous things; hit the enablers behind them. Just a heads up, your Hollow Phoenix list is missing the creatures. Broken tag in the decklist. Thanks for the heads up. I just picked up UW Spirits recently, so I’ve been really appreciating reading all your takes on the deck in your articles, David. There’s a pretty dedicated group of UW Spirits players who discuss the deck and strategies on Discord: https://discord.gg/UfNFysS. We’d love to have you in there to provide some of your own insight if you’re interested.